Everyone knows boys are falling behind girls in education. And that has lots of people, especially educators and politicians, busy pointing fingers and engaging in loud discussions. Largely left out of this discussion are parents of boys, who are perhaps more aware than anyone that their bright, eager sons hit an invisible wall somewhere near fourth grade, after which they go from engaged to unengaged, discouraged, and disaffected. By their teens, too many seem determined to be slackers in school regardless of parental pleas, incentives, or discipline. There are lots of books on underachieving boys, but most address educators and come complete with intimidating graphs, case studies, academic-speak, and lists of remedies on which parents are powerless to act. about it? What about mentors who crave positive support, not political shrillness? Most existing books on “the boy problem” make parents feel even more helpless than the school system and their job demands have made them feel already. In Jump-Starting Boys, we have endeavored to empower parents and mentors, and to give them a sense of being able to reclaim the duty and rewards of helping their children. Toward this end, we have heartwarming true stories and take action checklists. Our aim has been to reassure and support, to turn fear and guilt into can-do confidence. Who are we? Sisters who have raised boys, and sisters who have worked four careers between us: teacher, family therapist, journalist, and author. Pam is the award-winning author of young adult books particularly popular with boys (including Peak Survival, Skater Stunt boys, and First Descent). Cynthia, a former teacher who now counsels troubled families, speaks regularly at parents’ groups and women’s gatherings. We firmly believe that reading confidence is a keystone to educational success, which in turn increases one’s chances of a more stable, satisfying life. 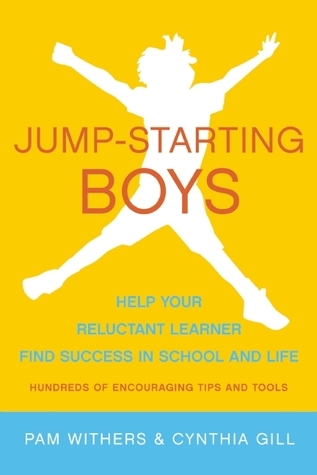 We hope you’ll find insight in Jump-Starting Boys. Everyone knows that boys are falling behind in education. Largely left out of the discussion are parents of boys, who are most aware that their bright, eager sons hit an invisible wall somewhere near fourth grade, after which they become disengaged, discouraged, and disaffected. There are dozens of books on underachieving boys, but most parents brave enough to lift one off the shelf are instantly intimidated by the footnotes, graphs, case studies, and academic-speak addressed almost entirely to educators. What about the average guilt-ridden, frustrated mother or father of an underachieving boy? Jump-Starting Boys: Help Your Reluctant Learner Find Success in School and Life is the first book on the market that empowers parents, helping them reclaim the duties and rewards of raising their children and navigate the influences of school and media. Filled with reassurance and support, the authors turn fear and guilt into can-do confidence. Through easy tips and action list sidebars, this is the most practical, readable book on the topic. Teach your son to be self-motivated, lifelong reader! Pam Withers is the best-selling, award-nominated author of more than a dozen adventure novels particularly popular with teen boys. They include Peak Survival, Skater Stuntboys and Vertical Limits. She lives in Vancouver. During her 30-year career as a high school teacher, Cynthia Gill worked on innovative curricula development and served as an academic dean while winning acclaim for her work in the classroom. Gill has taught as an adjunct faculty member at Globe University and enjoys public speaking, particularly on parent education. She has led numerous groups of students on educational and service trips to Russia, Germany and Latin America. A former homeschooling mom, she also served as a consultant to homeschooling families with an accrediting organization. She lives in Minneapolis. John Duffy is the author of The Available Parent: Radical Optimism for Raising Teens and Tweens, and a clinical psychologist and certified life coach with a thriving private practice in the Chicago area. He is also a national parenting and relationships expert on The Steve Harvey Show. You can purchase Jump-Starting Boys at Amazon and Barnes & Noble. It’s also available for Kindle and Nook.